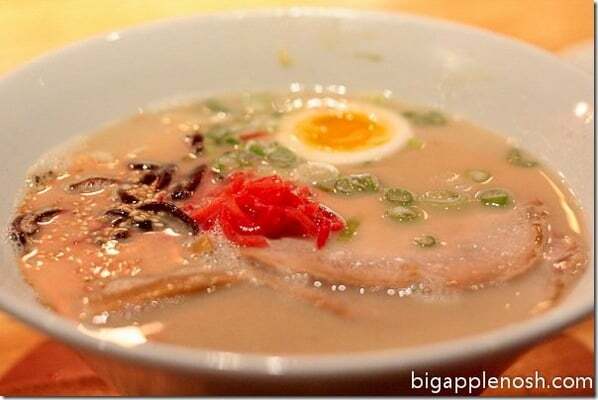 Ippudo, a ramen chain imported from Japan a few years ago, offers a variety of ramen, appetizers, drinks and desserts. But I am loyal to one bowl of noodles alone – the Akamaru Modern. Featuring pork belly, cabbage, a medium-cooked soy egg, scallions, chewy, springy noodles, garlic oil and “special sauce” – the broth is a study in umami. I am jealous of others slurping out of the bright red bowl, even though I know my own will be placed before me in a few minutes time. I plan my Ippudo trips days in advance and look forward to my Modern. I pick less-busy days from work so I can go to Ippudo early. Sounds crazy – all this for a bowl of noodles? You’ll understand once you’ve tried the Modern. Enough about the Modern though – you’ll just have to try it for yourself! Ippudo also offers a variety of appetizers. I’m a fan of the hirata buns – steamed pork buns with sweet/spicy sauce. This time, my eating buddy and I tried something new – the tori karaage. 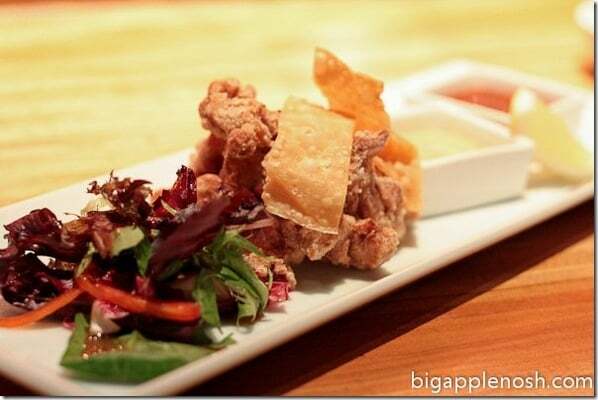 A crispy fried chicken dish accompanied by chili and mayo dipping sauces, we couldn’t go wrong. Fried? Mayo? Sign me up. And for those who want to try a different ramen selection (who are you?? ), the classic offers a milder alternative. Less garlicky and decidedly milder, I’d suggest the classic if you want to go easy on your taste buds. But really, get the Modern. The wait is long. I’m pretty sure the hostesses hate me (I’m a “How much longer is the wait?” customer. I’m impatient, remember?). But I will keep returning as long as the best bowl of ramen in NYC awaits me. Worth the (really long) wait! unnnnngh. me loves the modern. the first time i went to ippudo i also got the classic (b/c it's called classic, it has to be good!) it was good but i wasn't jumping up and down or anything. went back a second time and had the modern. OMG. Looks and sounds delicious. I love ramen, and the Modern seems amazingly worth the wait. If I'm ever in New York again, maybe the Modern is the ramen that will finally convince me that ramen is actually good. uts:you are a liari do not worship even half of hocaia!whmbh half disses you and your jobless homeless starving hobama nazis most??? If it's as good as you make it sound, I'm sure it's worth the long wait. I'm a huge fan of garlic, I'd have to go with the traditional ramen. i wasn't sure if ippudo would live up to the hype and those long lines, but hell it really does. thanks for all these yummy pictures! You had me at noodles and garlic oil 😉 The modern looks amazing! hey have you tried hidechan? a worthy contender to ippudo! Hard to improve upon perfection, but it's even better (and cheaper) in Japan! Gahhhh I want the Modern…NOW! I've never actually had ramen before…gasp!!!! Ohh how I miss you Ippudo. I must have ate there 30 times during my month long trip to Japan. I was so lucky to have stumbled upon it early in my trip. 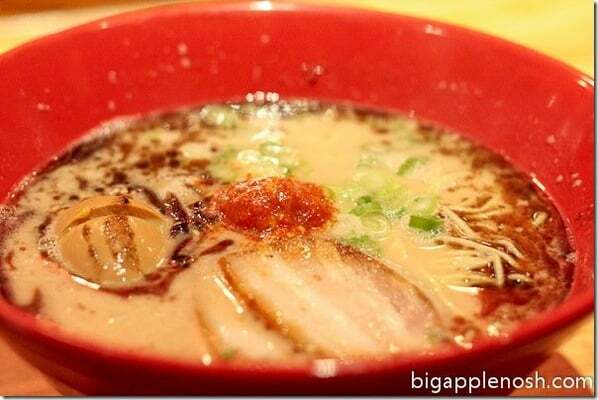 I went to over 15 different Ippudo's each usually had their own special version or twist. Tao Ippudo in the area of Yoyogi had a slightly different version of the Akamaru Modern…and it was even better.